In these lessons, we will learn the Power Rule, the Constant Multiple Rule, the Sum Rule and the Difference Rule. We have included a Derivative or Differentiation calculator at the end of the lesson. It can show the steps involved including the power rule, sum rule and difference rule. The following diagram gives the basic derivative rules that you may find useful: Constant Rule, Constant Multiple Rule, Power Rule, Sum Rule, Difference Rule, Product Rule, Quotient Rule, and Chain Rule. Scroll down the page for more examples and solutions. It is not always necessary to compute derivatives directly from the definition. Instead, several rules have been developed for finding derivatives without having to use the definition directly. These formulas greatly simplify the task of differentiation. Using the power rule formula, we find that the derivative of the function f(x) = x would be one. Using the power rule formula, we find that the derivative of a function that is a constant would be zero. The constant multiple rule says that the derivative of a constant value times a function is the constant times the derivative of the function. The Sum Rule tells us that the derivative of a sum of functions is the sum of the derivatives. The Sum Rule can be extended to the sum of any number of functions. The Difference Rule tells us that the derivative of a difference of functions is the difference of the derivatives. An explanation and some examples. How to find derivatives using rules? In this video, we look at finding the derivative of some very simple functions by using the power rule. This video uses the power rule to find the derivative of a function. How to determine the derivatives of simple polynomials? How to differentiate using the extended power rule? 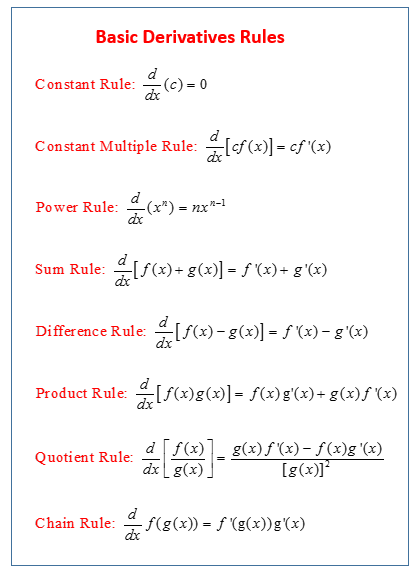 The extended power rule involves using the chain rule with the power rule. The following derivative calculator can show you the steps and rules used to get the derivative of the given function. Use it to check your answers.